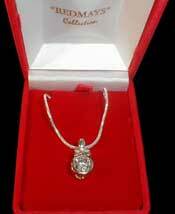 All Pendants Now Come in Superb Quality Imitation Black Velvet Presentation Boxes. 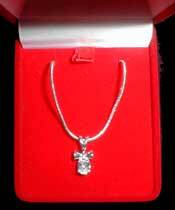 10mls Silver Plated Bow Setting with a Large Diamond Like Cubic- Zirconia, Hanging From A 10 Mils Silver Plated Snake Chain. Now Comes Complete in a BLACK Imitation Velvet Presentation Box with NO LOGO. 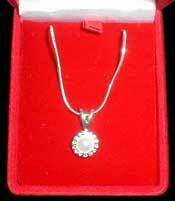 10mls Silver Plated Pendant with a Simulated White Pearl in the Centre, Surrounded by Tiny Diamond-Like Cubic Zirconia. 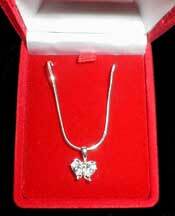 10mls Silver Plated Bow Setting, With a Diamond-Like Cubic Zirconia Teardrop Pendant Hanging From A Silver Plated Snake Chain. Sparkling and Delightful 10mls Silver Plated Diamond-Like Cubic Zirconia Butterfly Pendant Hanging From A Silver Plated Snake Chain.